Five puppies were found hungry and cold in a dumpster in Marshall County. A local pit bull rescue group Pretty Pitties received a call from County Animal Control Deputy Jason Williams about the puppies who were left in a dumpster to die. The rescue collected the puppies and nursed them back to help except for one. The puppy was suffering from numerological issues including seizures and was put down. "It deeply saddens us that this happened when we have tried so diligently to get the word out that there are resources for unwanted litters, and animals to be fixed in this County," said an official with the Animal Rescue Assistance Team Tennessee in a social media post. 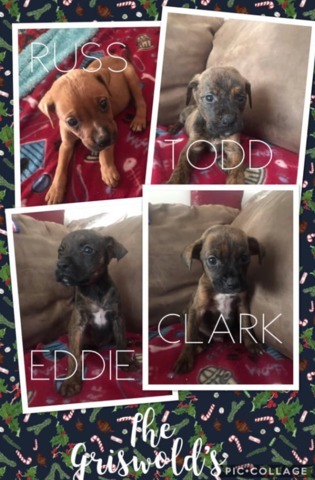 Rescue organizers named the remaining four Clark, Eddie, Russ, and Todd in honor of the Griswold family in the classic Christmas movie, National Lampoon's Christmas Vacation. They are healthy and up for adoption. Anyone interested in giving them a forever home can call Pretty Pitties at 931-224-8588.